In looking to see how other people have documented the Pacific Northwest I came across the book ‘Beneath Cold Seas‘ by photographer David Hall. While this is not the kind of photography I usually gravitate towards the photographs are undeniably compelling. 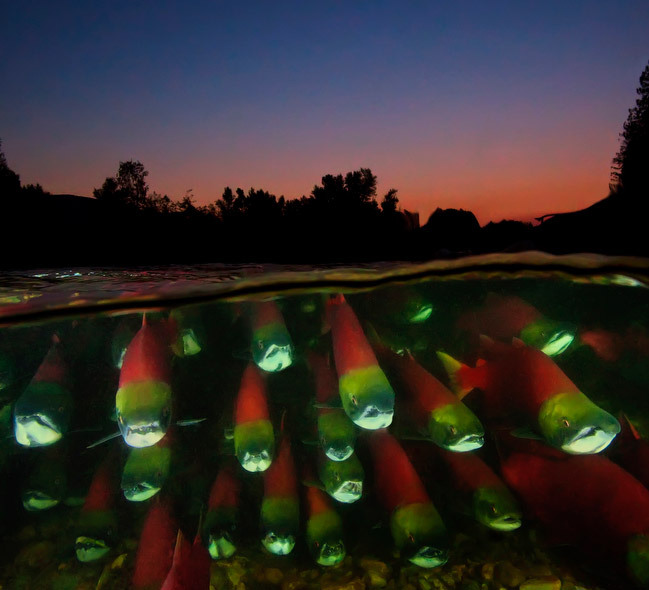 I particularly like the juxtaposition of what’s going on below and above the surface as in the photograph of sockeye salmon above. Photographer Hall completed this body of work over a period of 16 trips to British Columbia between 1995 and 2010. I can only imagine how technically challenging this type of photography must be, managing both scuba gear and bulky camera equipment that’s made even bulkier by the underwater housings that you need to protect them. Then of course the water’s cold. What is striking to me is how colorful much of the marine life is. Something I thought that you had to go to the tropics to see. To see more of David’s work visit his website – www.seaphotos.com and watch the gallery of his images below.